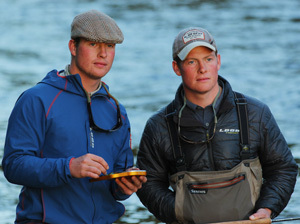 William and Alastair Peake AKA ‘Twinpeakes’, are both certified casting instructors, and offer fly casting instruction on the fabled Aberdeenshire River Dee. They operate a fly fishing school teaching all aspects of double handed fly casting, with professional structured tuition to suit all levels of ability and tailored to specific requirements. The school is ideally located in Aboyne on exclusive water, where they have access to both banks and are able to comfortably teach modern casting techniques in real life situations. They have some glorious pools to learn to cast on and there is always the opportunity to fish on after a lesson to apply your new skills to catch some Atlantic Salmon. Supported by Loop Tackle Design, all tackle can be provided to ensure learning with quality balanced equipment.